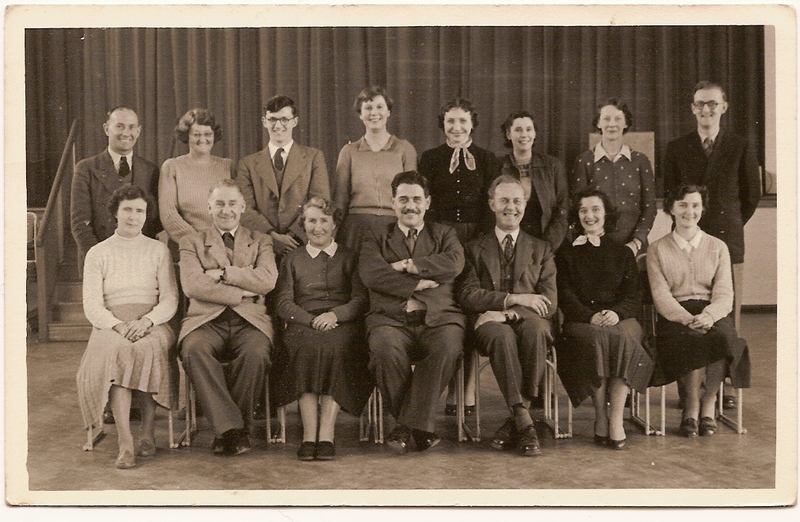 This is for all of you who attended Woodingdean Primary School in the late 40s to early 50s. So many of you have mentioned these teachers so I thought you might like to see this photo. Now we need to identify them – anyone care to try? Hello Janet. Thanks for sharing this lovely picture with us. I can certainly name a few of the teachers! Mr Haggard is seated in the middle Mr Hemsley and Mrs Rice are to his right, Mr Betts is standing on the far right and is the tall lady standing in the middle to the right of the chap with the glasses Mrs Betts? Taking a guess at a few more is Mrs Nowvaski and Mr Hardacre sitting to the left of Mr Haggard? Also, again just a guess, is Miss Retchless the lady standing second from the left? Look forward to someone naming all fifteen smiling faces! Thanks again for the memory. Hi Chris, I can help with a few more names: Miss Hughes, Mr Bentham, Miss Backhouse, Mr Scales and Miss Stanger. Let’s hope someone can fill in the others for us. Hello Janet. A senior moment on my part, one of many these day. Of course the name was Mr Oldacre not Mr Hardacre. Thanks for more names. I am not going to be tempted to name any more. My goodness Janet – a marvellous photo. Assuming I’m right and (Major) Haggard was head as of 1953, this would give this a more precise date. Of course the head, Miss Stanger and Mrs Novwaski were there during the 60s and 70s. We used to walk Miss Stanger’s lovely dog during the lunch-hour during our last year there. Any more of these? Mrs Betts was my teacher. I remember her marrying Mr Betts sometime during the time I was a pupil there. She was a smashing teacher, I remember we use to play Lotto on a Friday afternoon in her class. I was Cinderella one year in the school play and the following Christmas, I played Sleeping Beauty. There was this boy who was prince charming called Michael who had an awful forever runny nose who had to kiss me awake – ug! One of the other little girls’ mother loaned me her daughter’s beautiful pink, long dress for my ball gown. I felt so good in it and have never forgotten her kindness. I liked that school very much. Hi Janet I was in Miss Stanger’s class in 1958 and had my picture taken with her lemon tree which appeared in the Brighton Argus. Hello Janet. I recently met up with Roger Hemsley. He informed me he was not into all things internet. However he gave me some old Woodingdean School photos from his father’s collection, showing teachers, class photos and sports teams. Roger is happy to share them with others. There are ten in all, taken in the early 1950s. Perhaps you have the same in your collection, as they seem be taken in the same era as your published photo? It would be great if I could somehow send you copies as an addition to your collection. Kind Regards. Hi Janet, I went to that school when we first moved to South Woodingdene in 1953. We were the very first family to move into the houses in Cowley Drive, No 186 in fact, in between what became Shipley Road and Foxdown Road. My first teacher for the year that I spent in the infants was Miss Stanger, who I remember well for reasons that are beter not mentioned. I remember Mr Hagard (Major) as he was the head master, Mr Betts was our sports teacher, I do remember some of those already mentioned, but one of the lady teachers was Miss Walters, and I was in her class for most of my time there. When we moved to Ash Cottage our classroom was in the front door first right, ground floor. Also the care taker Mr Housey, who went to live in Australia, is not in the photo. I’m now 62, done a lot of things in my life, but I now live in Southern France, but it was wonderfull to see that photo after all these years. Just wondering if you are the Janet who is married to Jim who worked for Tesco? Hi Tony. Yes I am. I have been married to Jim for 42 years. Hi Janet, nice to know you are both ok. I used to be married to Sue and we lived in the flat below you in Portslade, many moons ago, Wondered if you remembered me. Best wishes to you both. Great website. I lived close to the Fleets in Cowley Drive during the late fifties until the late seventies, and went to Woodingdean, Rudyard Kipling and Longhill. Does anyone remember the Entiknap family? I remember most of the teachers in the photo, especially Mrs Rice (previously Miss Barnes). She was incredibly glamourous to us and wore a pointy bra and sticky out skirt + used to flirt outrageously with poor Mr Betts! She took the ‘top’ class I think. I was there from 1951 to ’58 – then went to Varndean. My name then was Mary Barnett and I lived in Seaview Road. Hello Christopher, I’ve just remembered Miss Barnes christian name, it was Joan, but I don’t know what happened to her in terms of any later career moves. Would be interesting to find out. This is a marvellous site for those of us who moved away from the Brighton area many years ago but still have good memories of their school days in Woodingdean (apart from the time Major H smacked my legs)! Bottom row second from right is Norma Tamkin (my mum’s niece). Was interested to read your memories of Woodingdean Primary. All three of my children attended this school in the mid 80s and early 90s and my daughter from about 2004. I was a teacher myself and worked in other local schools. A friend of mine worked at Woodingdean in about 1973/4 just before Major Haggard retired he was quite a character! Some of you may be interested in our Then and Now exhibition to be held at The Church of the Holy Cross in Woodingdean on 5th and 6th March. if so have a look at http://www.woodingdeanholycross.co.cc. I was at Woodingdean from 62 to 68, Primary to Junior. Let’s be honest, it was a rubbish school. Would you mind if we took a copy of your picture to show at our Then And Now Exhibition in Woodingdean on 5th and 6th March 2011? Hi Christopher I look forward to seeing the pictures at “Then And Now” in Woodingdean. I know we have been in contact with Peter Mercer. All my children went to Woodingdean Primary but a bit more recently. Hi Kaz – only just found this site and read your comment about the guy Mick with the runny nose, his name was Mick Gander (nickname ‘Goose’). He lived next door to the Spar shop in Bexhill Road. I only knew him because he kept pigeons as I did and I never ever saw him without a candle hanging from his nose. Hi Janet, just wondering if you would be the same Mrs Gravett who’s son Steve attended Woodingdean Middle School with myself from 1979 to 1983? I went to Woodingdean Primary around 1960 till 1963 and immediately recognized Mr Haggard. Unfortunately I can’t recollect any of the other named teachers. I vaguely remember a Miss Crumpet and Mr John Snow who taught maths and was also a famous and well-known cricketer. It would be nice to hear from someone who could verify this. I found this looking for proof that one of my old teachers played cricket for England (John Snow). I lived in McWilliam Road and went to this school 1961-1965ish before moving to Devon. I remember Major Haggard and his friend Jimmy Edwards (Mr Wacco of TV fame) who used to do prize giving. Mrs Nowvaski was my class teacher! I’m sorry but I can’t recall any of my classmates’ names now. Found this site by chance, I went to Woodingdean school 68-71, (live in West Yorks now) I remember Mr. Haggard, only today mentioned him to my grandson what a coincidence I remember Miss Schmitt and dreaded Friday morning maths tests! Does anyone remember Mrs Messenger?